Let’s talk about September 1992. I had fairly recently turned ten, I had become the proud owner of a Super Nintendo, and I didn’t know what DC Comics was. Everyone had seen the Michael Keaton Batman, of course, and the sequel had been one of the previous summer’s biggest hits, but I don’t think I had any real understanding of how Batman and his affiliates fit into any sort of larger universe. As far as I knew, Batman, as a series was a thing on its own, no more likely guest-star Superman or Wonder Woman than Spider-Man or The Incredible Hulk. The animated Batman series had only started airing on September 5, 1992, and that depiction of Batman was very Gotham City-focused. I had never seen Super Friends and had never opened a comic book. Like The Simpsons and later Animaniacs, however, Tiny Toons taught me a lot of pop culture, even if I’d only understand the references years down the line. 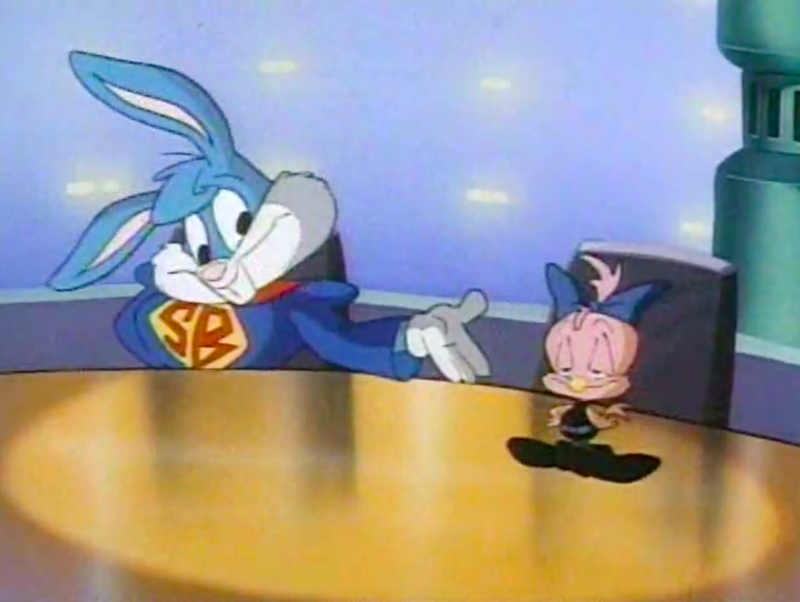 And on September 15, 1992, Tiny Toons aired a segment titled “The Just-Us League of Supertoons,” and it gave me my first look at an expanded DC universe. Written by Paul Dini, who’d was also a writer for Batman: The Animated Series and its spinoffs, this episode centers around Batduck, the Batman parody the show had introduced back in 1990 — notably well before the premiere of Batman: The Animated Series, making it the first time I’d seen an animated version of Batman. And the episode has Batduck and his Robin stand-in, Decoy, joining up with an exclusive team of superheroes who are all Tiny Toons versions of actual DC characters. 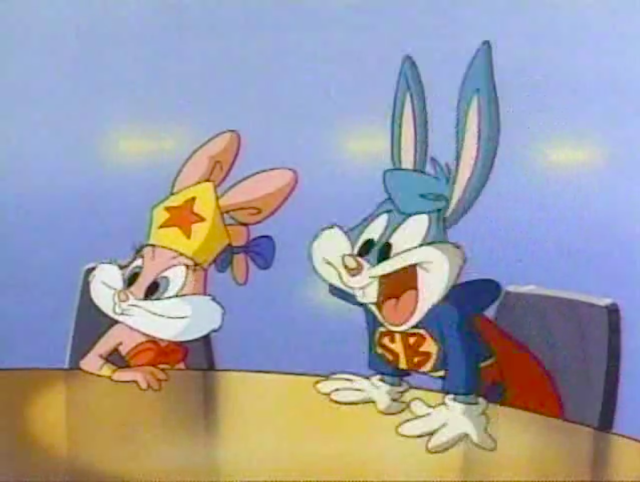 There are Superbun and Wonder Babs. 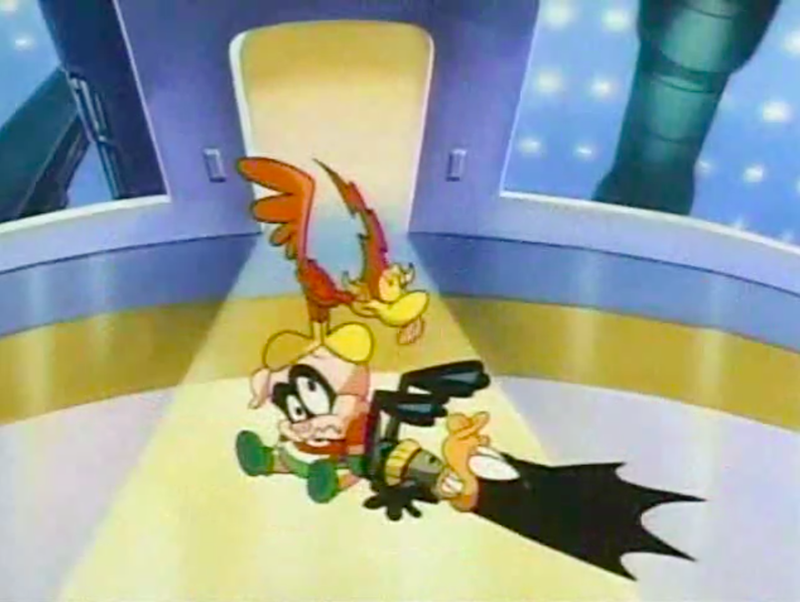 The Flash parody is assigned to the Tiny Toons equivalent of the Roadrunner. Aquaman is Aquamutt, and I think the episode is making a joke about Aquaman’s uselessness by having him played by Byron Basset, a Tiny Toons character without a clear Looney Tunes analogue and who never did much aside from sleep in a weird, dog-puddle formation. 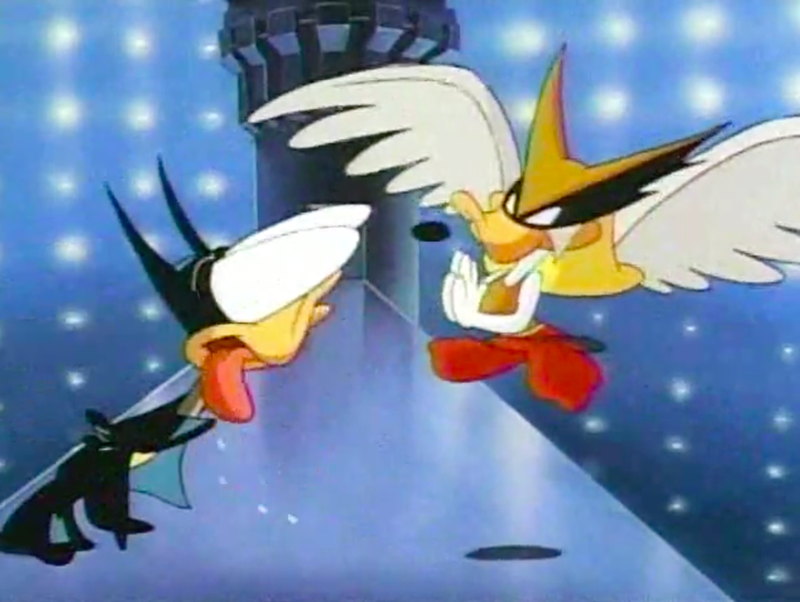 Shirley the Loon, the most pop culturally complex character on the show, shows up here playing Hawkloon, a play on Hawkgirl and a hint at the future of the DC Universe, where Hawkgirl would become a more important character than Hawkman, the character to which she ostensibly serves as a sidekick. When Batman: The Animated Series evolved into Justice League in 2001, Hawkgirl was the team’s second female member, after Wonder Woman, and now the CW spinoff of The Flash, Legends of Tomorrow, will feature Hawkgirl as a main character once again. I’m certain this Tiny Toons episode was the first time I’d eve heard of Hawk-anything, however. It’s probably also the first glimpse I got of Black Canary, who in this parody is played by an actual canary and named Pink Canary. 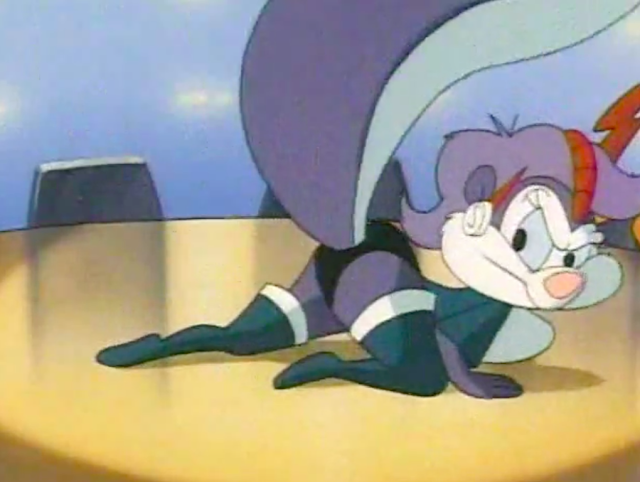 She doesn’t really do anything, aside from wear the teeniest set of fishnet stockings in the history of cartoons, but at least she doesn’t make a domestic violence joke. 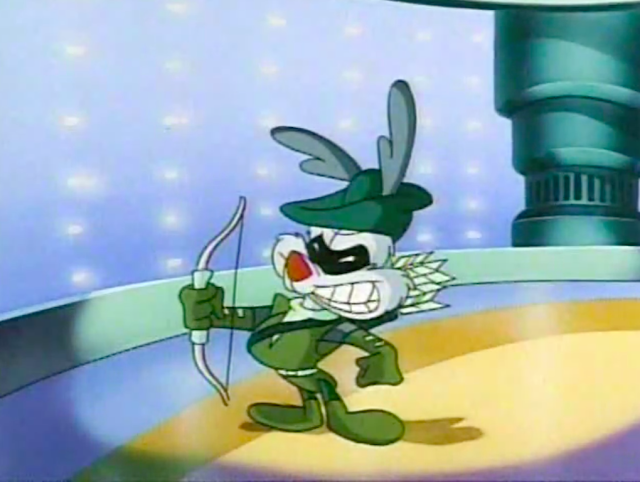 Green Arrow becomes Teen Arrow, though there’s not any reason in particular that he’s being played by the Tiny Toons version of Wile E. Coyote. And finally there’s Fifi playing Scentanna, a version of Zatanna, the Justice League’s No. 1 spellcaster. Just a few months later, Batman: The Animated Series would introduce Zatanna as a one-off character. Voiced by Julie Brown, Zatanna is the only non-Batman series character to show up in the original run of the series. It’s not surprising: Paul Dini is a Zatanna superfan and it may be no coincidence that he married a real-life stage magician. Watching the episode today, it’s hard not to focus on the fact that they sexed Fifi up. I mean, look at this pose. This is how fetishes get started. Sexiness aside, if this counts as a Zatanna appearance — and I’d say it kind of does — then this is her first-ever appearance on TV or in a movie. You can view the entire segment below, should you be interested. To me, it’s interesting to think about Dini getting these DC Comics characters show up in parody form years before they showed up in earnest on Justice League and Justice League Unlimited, a show that sent me down many and many a research hole learning the characters’ long, weird histories. I’ll bet that Dini might have thought this parody might be his only chance to get these lesser-known DC characters to show up on screen. 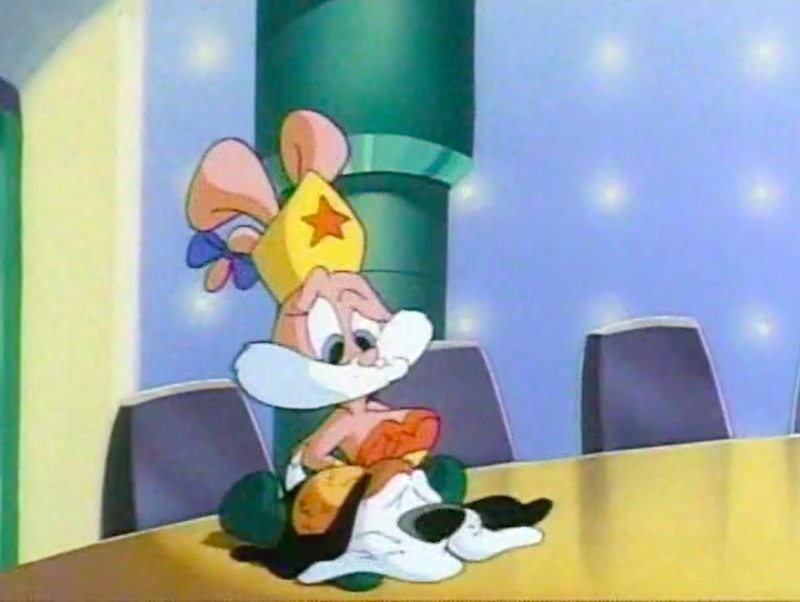 I’ll bet not even he thought that Tiny Toons would end up being a stepping stone towards building the DC Comics universe and getting more people invested in it. Through this episode and in a lot of other ways, Tiny Toons helped make Batman: The Animated Series happen. And it in turn helped shape Batman at large, helped make Batman what he is today. Think about it: If Tiny Toons hadn’t happened, Paul Dini might not have had the opportunity to move onto the animated Batman, where Dini introduced the character Harley Quinn, who transitioned to the comics and who is now debuting in the live-action, big-screen Suicide Squad. 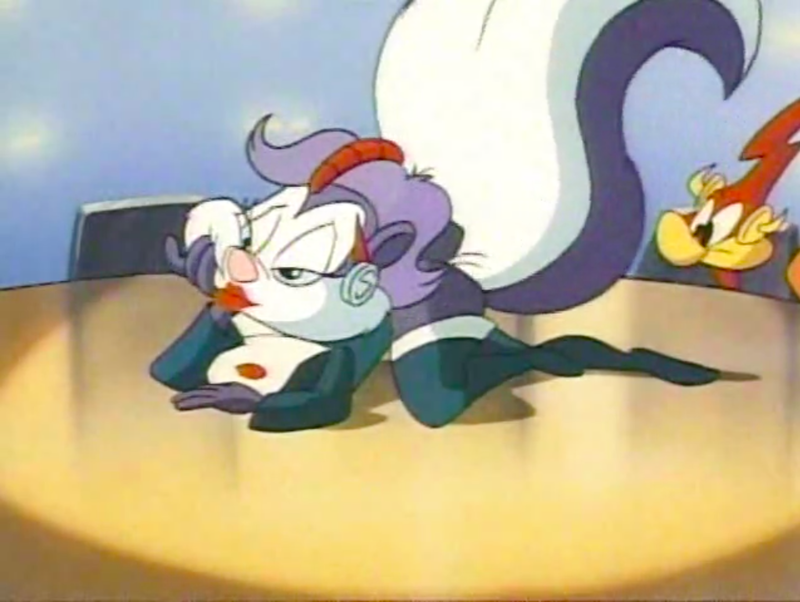 Julie Brown would eventually also voice Minerva Mink on Animaniacs, another female cartoon character who was, for better or worse, sexed up more than most. What is the deal with sexualizing skunks? There aren’t that many anthropomorphic skunks out there, and most of the famous ones are overly amorous. The Just-Us League of Supertoons has better gender parity than most superhero teams on TV shows or in movies. Since this episode aired, all of the characters have shown up in some live-action DC adaptation — except for Wonder Woman. Batman v. Superman, which boasts the first live-action appearance of Wonder Woman since the Lynda Carter days, opens in theaters on March 25, 2016. The CW’s Legends of Tomorrow debuts sometimes in early 2016. Therefore, there’s a chance Hawkgirl will star in her own show before Wonder Woman appears in a supporting role in someone else’s movie. For what it’s worth, Ciara Renée already cameoed as Kendra Saunders in the season finale of The Flash. It was just a non-speaking role, but she already technically beat Wonder Woman to the punch. Speaking of Harley Quinn, the news that Courtney Love was briefly considered for playing the role in a sequel to Batman & Robin allowed me to point out to a whole new group of readers that the character was inspired by a scene in Days of Our Lives. I will never tire of pointing this out to people. 3) Green Arrow is known for his gadgety gimmick arrows, which is probably why Calamity Coyote was used. I know what you mean in your first point, and boy, they even had even more fun with Fifi's figure, they sure enjoyed giving kids confusing feelings back then.